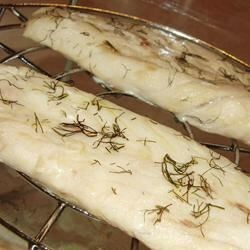 "A simple recipe for barbecued sea bass. If the fish is fresh, this dish is sure to please. Great for beach side cookouts." In a small bowl, stir together lemon juice, olive oil, salt, pepper and bay leaf. Rub fish with mixture inside and out. Grill the fish over medium heat for 8 to 10 minutes, flipping halfway through. Fish is done when it flakes easily with a fork. See how to make quick-and-easy, Asian-inspired grilled sea bass. This is so simple to make! The flavors compliment the fish perfectly, they don't cover it up.